F-Commerce is one of the newest form of online business versions which got popular among the young entrepreneurs of many countries because of its wide marketing reach due to better targeting, greater interaction and higher return on investment. This form of business is really appreciated by the new generation of people who shop online. This mainly ascribes to the fact that shopping in Facebook pages is convenient for the young generation. In Bangladesh there is no difference from the global scenario, and the prospect of F-commerce in Bangladesh is even better. Growth of F-commerce community is phenomenal considering statistics. Ease of usage plays a role behind the popularity of F-commerce stores. F-commerce emerge as one of the solution of unemployment for many as they start a small business through Facebook page and earn handsomely figure from business. Facebook pages offer diversified products which encourage customer to visit and purchase more. F-stores are able to setup their online store for free and they do not have to deal with websites or a physical space, requiring very little investment. Globally, F-commerce comes under ‘Social Commerce’ that covers all social media sites including Whatsapp, Instagram, etc. In India, 79% of e-commerce sales is due to social media platforms. Due to the thriving social commerce in India, Facebook has also launched ‘Facebook Marketplace’ that allows people to buy and sell in their community. The global industry is much more developed with legal frameworks in place. 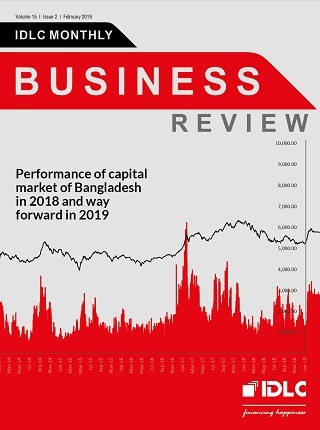 Increased tariff on imports: High tariff rate is felt in the F-commerce industry in Bangladesh because most of the stores are resellers or import materials which restrict the group from achieving economy of scale. Logistics: When it comes to the delivering products outside Dhaka it become tough for these small stores because outside Dhaka delivery service is poor and mostly dependent on local courier services. No legal framework: No surveillance on the F-commerce sites and no legal structure make this sector unorganized and defamation of the business is a big issue. Payment System: Platforms like ShopUp, have allievated the problem to an extent by enabling bKash payment. Most stores are still highly dependent on cash on delivery or use a complicated process for mobile payment. Insufficient business knowledge: In this large pool of stores, majority of them fail to create a sustainable business in the long run due to lack of basic business knowledge such as customer management. Access to financial funds: Many of the Facebook stores are not registered and have no trade license, while others fail to maintain proper financialstatements. Thus, banks are often hesitant to provide them with loans due to the high risk of defaulting involved. Loans available to them are subject to high interest rates. Facebook’s algorithm change has thrown in some challenges. Sometimes businesses are unable to use hashtags, make posts public or publish videos. Boosting has become expensive as it now costs 3-4 times more to get similar reach compared to the years before 2018. Thus it is hard to acquire new customers, and posts have to be made in the pages constantly to have the same reach and relevance. The algorithm is such that the pages with frequent posts are promoted. It becomes difficult for business owners who are students or has other engagements to be regularly active on the pages. Engagement on the pages are dwindling and targeting of boosted posts are not as effective as it was before. Businesses are now considering to shift partly or completely organic methods for reaching customers. Customers may end up purchasing products but they may not share the page with their friends. So focus on product relevant content such as engaging videos is expected to rise. Nurturing loyal customer base who always recommend products to their peers, and increasing popularity of alternative channels like Instagram are allowing the businesses to cope with the algorithm change. ShopUp is a Facebook features for merchants. It did not have a smooth start because customers were unwilling to use an external site for ordering. But now ShopUp has been able to incorporate all necessary features to their platform and given businesses the automated process of inventory and order management. It can also handle delivery which is very easy due to their panel system. However, there are some complaints. The payment processing at times has been delayed. But few of the stores feel that when multiple brands work under the umbrella of a larger, dominant brand, the bigger brand (ShopUp) gains greater attention than the smaller brands. Some owners would prefer a separate, customized service from ShopUp which is not available currently. The whole database of the business is exposed to ShopUp, which is yet another risk. There is room to make the ecosystem of F-Commerce better. It very easy for anyone and everyone to start their business over Facebook but maintaining authenticity is tough because this is an issue that can end up affecting other stores. It has been identified as one of the key reasons for the stumped growth of F-commerce in the country even though this industry has great potential ShopUp can enforce that these business should at least fulfill a certain criteria before starting their operations. Fraudulent activities and lack of business professionalism are causing the customers to lose their trust in e-businesses. Change or revision in a few of the regulations has been called for. To state an example, a passport and proof of citizenship can be considered enough for allowing someone to run the business with a trade license. Additionally, the FinTech platforms could enable businesses to make a merchant account that will help facilitate the payment mechanism. This is currently not possible because they require a physical store or a ‘signboard’ for proof of business. 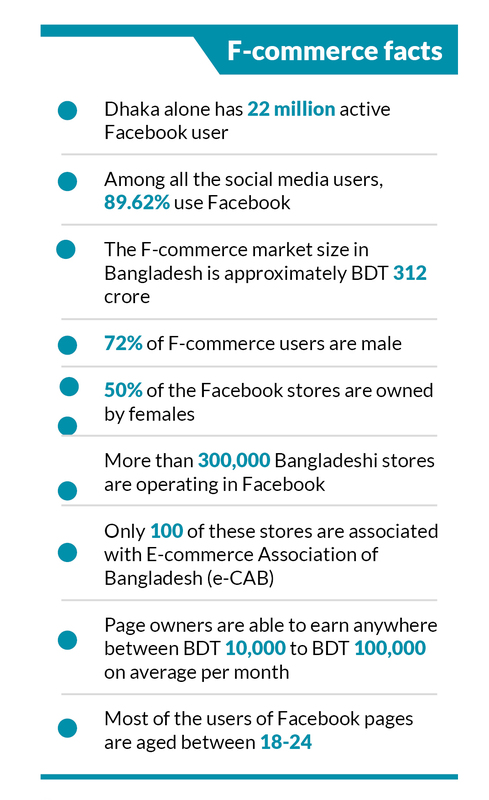 In order to understand the F-commerce ecosystem of Bangladesh, four popular Facebook businesses of different types were interviewed by MBR in order to learn how these F-commerce stores started their journey and the hurdles that they overcame and still face. Poter Bibi started out in 2015 with a small investment of and with very limited designs. Collecting few local weavers’ available designs at a small scale, it was quite a challenge for them at the very beginning because handloom sarees that are available in market are not preferred by mostly young generation due to its bulkiness and high prices. Therefore, keeping quality intact and producing bit comfortable sarees in a reasonable price range to attract young consumers. Start of the journey was with Facebook community in the beginning, they got huge response. Getting motivated; with differentiated design and quality fiber they created customized designs. Poter bibi tried to put local community, Bangladesh heritage and culture through their designs. Since Bangladesh’s fabric and textiles industry is flooded with Indian and Chinese products, the only way to compete in the industry was by providing unique designs while keeping the traditional aspect intact. Whole process doubles the cost but profitability is still there because customers judge quality and so price becomes a secondary concern for customer. The resources are dedicated to only Poter Bibi which is a great advantage. During last few years Poter Bibi scaled their business, and they are targeting to make it the designated solution for deshi shares in F-commerce platform. But still inventory management, maintenance of customer database and production of other statistics are real challenge to them. Funding from the bank was impossible due to lengthy and slog process of bank loan. Regulators and Government authorities can now think to update the trade regulations to help the SME to scale up more to contribute in social economy. In 2012, Rupanzel’s Secret started with the hair oil made by the owner’s grandmother for the past 50-60 years which they used all the time. The hair oil started to get attention among her friends and closed groups encouraging her to start her business through her Facebook page. After a lot of process development, the brand flourished through their products and packaging and became one of the first movers in the F-commerce industry of Bangladesh. Back then, the page gained immense popularity just through their customers and word-of-mouth. Now they have to invest in strong marketing and promotions to get new customers. They got organic reach initially, now the page spends USD 10-12 to reach customers. True strength of Rupanzel’s Secret lies in the fact that they have a well-established position in the minds of a strong loyal consumer base. They wish for a better F-commerce ecosystem that wouid help the whole industry to grow. Since there are tons of sellers emerging every day in Facebook and the product and service quality is deteriorating, it is a huge concern. So they hope that every businesses fulfills a certain criteria before starting the business. With increasing fraudulent activities customers tend to lose their trust in actual, authentic businesses. Gorur Ghash started out in 2014 as a partnership between two friends. Initially they used to sell posters for wall accessories and it was limited to a very small community. The business wasn’t doing as well as they hoped and one of the partner decided to leave. Later in 2017 Nahiyan decided that he want to revamp the business into a clothing line. So, he reached out to two of his friends- Fahim and Ali and the three of them started Gorur Ghash as a clothing line. Their introduction of ‘The Denim’ campaign was really well received and that’s when Gorur Ghash took off. The brand is appreciated for unique designs and great quality at lowprices. And the overarching theme of their content is to make things fun and relatable. So their name, campaigns, receipt, all carry the funny and witty aspect in line with their name and positioning. Humor is now a quality that defines their clothing brand. However, to keep a constant flow of creative content running is hard at times. Facebook works in a way where they have to make sure to post relevant content everyday to keep engagement up. Additionally, it has also been a challenge to gain the trust of the consumers which they were successful to get so far. However, they feel that the online shopping scenario of Bangladesh isn’t well-developed making it necessary for them to maintain a very homely, informal interaction with their customers. Many Facebook pages don’t take real photos of their products and customers get delivered something entirely different from what they ordered. This is why Gorur Ghash invests their time on product photography to make customers believe in the authenticity of the products. And in order to further build their trust, they offer a trial policy where if the customers don’t like the product upon delivery, they can send it back without any charge. 100 candles a day. Besides the quality, the idea behind every candle is unique. People are not just buying a candle, but an experience. For example, their best seller candle inspired by the show, FRIENDS, will take the customer to Central Perk. Thus a coffee and caramel scented candle called ‘I’ll be there for you’ became an instant hit. They ignite nostalgia and warmth in people with the themes.